Julián Montaño studied Philosophy at Universidad of Sevilla, Spain, and holds a Master in Philosophy from University of Glasgow in the UK and an MBA from IE Business School. Julián worked at Grupo de Comunicación Recoletos before joining Walt Disney Company where he started as marketing coordinator to end up as marketing manager. He is now Deputy Director of Admissions of IE university for IE School of Arts and Humanities, IE School of Architecture and IE School of Communication. He teaches several courses in IE Business School and in other IE University schools. Recent courses are: Keys of Contemporary Culture; Knowledge, Culture, Meaning and Frontiers; History of Ideas. 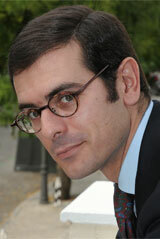 Julián also serves as a volunteer in different NGO´s focusing on diseased people in Africa and Spain. His main interest are: Epistemology, Aesthetics and Philosophy of Culture. Other areas of interest are: St. Thomas Aquinas, Scottish Enlightenment, Wittgenstein and T.S. Eliot. He is from Sanlúcar de Barrameda, in Cádiz, “a very philosophical land, even though Plato, Aquinas or Kant would found crazy people with a mad approach to life, unclassifiable, understandable” in Julian’s words. Las formas distintas, siempre precisas pero no necesariamente claras. Tú, apostilla sin stop al post de Miguel. Sobre los centauros y el desierto. Contra Antiquos.